Engine set near completion. Just the front of the engine air filter and turbo. I hope I will soon set into production. He is looking forward to adding the engine in my model. So an engine set for the Buffalo is next? Very good idea but I don't have New Buffalo and good detail photos or Parts manual. How about an engine for the M-ATV then. I bet it would be a good seller since there are now two on the market. What I would really like to see is an interior for an M2A2/A3 ODS Bradley. The old Tamiya interior just doesn't cut it any more. I sent Miliminis a bunch of reference pics for the interiors. They were going to do it, but have since closed down. I was hoping they would come through. Yes, I agree very good idea. Hmmm, sounds like that is in the works. Good news. Now how about that Bradley interior? It would go well with your Bradley engine compartment. Also Bradley interior is very interested. I see on you web site the engine , but no price or can we pre order and pay and you ship when ready? Teacher leave those kids alone! Now finishing the upper pulley, also pulley fan. Still underdrive pulley . Can you post a link to the engine? I can't find it on the website. 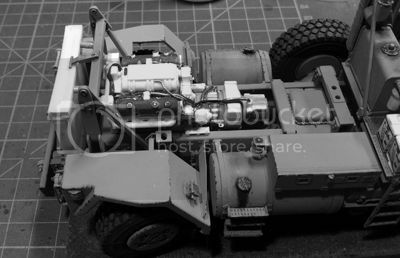 Hello Milo, Will your engine and transmission be able to be used in other vehicles such as the Hobby Fan M911 Oshkosh tractor? Would it be possible to see how the master parts are looking so far? I send photos next week. Now I prepared engine to form. I'm sure Milo is working his behind off to provide us with an engine for our HETs, it takes time to produce such items especialy something with this amount of detail in such a short period of time. He'll get it done soon I'm sure but in the meantime lets give the guy a chance to at least get it done. I know Milo is working hard and he is creating some great products. Nothing wrong with giving him ideas for future products though. One spy photos from build progress. Also, I would engine needed for the construction of the second HET.